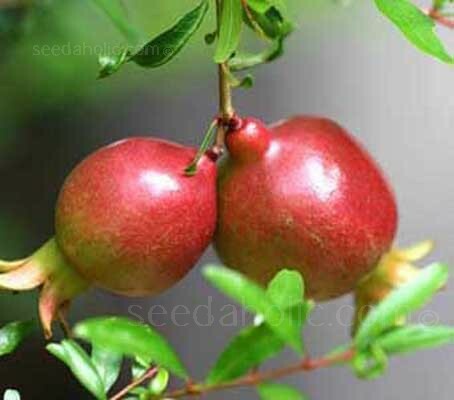 The Dwarf Pomegranate is one of the best compact, ornamental shrubs for courtyards and small gardens. It produces breathtaking orange/red trumpet-shaped flowers, followed by small 5cm (2in) orange/red fruit. It is a dense, deciduous shrub with leaves that are dark with beautiful hues of bronze in late autumn. Its compact size makes it suitable to containers. In areas with very cold winters it can be brought indoors. Where the dwarf fruits do ripen, they are no less edible than full-sized pomegranates from large shrubs or small trees. But being so small, with such thick rind & mostly seeds, the dwarf variety is realistically only an ornamental. This is, as it were, a scale model of Pomegranate and as such, makes an ideal plant for pot culture. It is now often offered as a house plant and makes a good miniature shrub for the rockery. It is also tolerant of the maritime climate and drought conditions. During winter the naked branches emulate the appearance of large deciduous trees, but bonsai-sized. It is not only small in stature, but even the flowers & fruits are dwarfed. It is one of the most popular of all dwarf trees for bonsai hobbyists. It is perfect for beginners as it stays naturally small, but even old-timers like this dwarf for the long-lasting scaled-down flowers & fruits that are easily gotten from potted specimens. It works well with many different styles for bonsai but the one most commonly used is the “informal upright”. Surface sow the seeds at a depth of 12mm (½in) using well draining soil or compost mix. Do not cover the seed as they need light to germinate. Place in a warm position in bright light and only lightly moist. Keep the pomegranate slightly damp at all times. Place in a position of good light, but where it is sheltered from frost and not exposed to drying winds. Don't plant the pot in a shallow container. It likes water and flowers well when it is slightly root-bound, so choose a pot that is a bit deeper than usual. It is not necessary to prune 'nana' for it to remain compactly leafed; but if it turns out to be a little bigger than wanted, it will not mind being trimmed in order to restrict size. They are very amenable to pruning and can even be sheered square and used for little hedges. It is best to prune in spring. The Dwarf Pomegranate does not require fertiliser, but a little bit of slow-release once a year, in spring, is beneficial. In warmer environments where it fruits heavily, the once-a-year light fertilizing will still be sufficient. It should be repotted every two years and can be very easily propagated and group plantings quickly created from quite thick branches taken from a parent plant. Florists greatly favour the Dwarf Pomegranate tree because of its ease in drying for use in wreaths and as Christmas tree ornaments. Dwarf Pomegranate fruit is delicious for making jelly and jams. Ripe fruit sounds metallic when tapped. Overripe fruit will crack open. The leaves can be steeped in vinegar to make an ink, and the flowers and fruit rind make a high-tannin dye. Birds, bats, and squirrels love the fruit. Punica granatum, commonly known as the Pomegranate, is native to Iran. It has been cultivated in the Caucasus since ancient times, and today is widely cultivated throughout Iran, Azerbajjan, Armenia, Afghanistan, India, Iraq, Israel, Jordan, Chine, Saudi Arabia and Egypt. It is also cultivated in the region of Southern Europe and tropical Africa. It was introduced into Latin America and California by Spanish settlers in 1769. The plant has been mentioned in many ancient texts, notably the Homeric Hymns, which celebrate individual Gods. It also is mentioned in the Book of Exodus in the Bible and is valued by many cultures for it’s beauty and uniqueness. It is believed the the Pomegranate was the Forbidden Fruit in the Garden of Eden. Stearn's Dictionary of Plant Names says: "The Latin name contracted from punicum malum, Carthaginian apple, in turn derived from Poenus, meaning 'a Carthaginian,' or Phoinikes, meaning 'Phoenicians,' "
This is the generic name of the pomegranate, Punicum granatum. The species granatum is derived from the Latin meaning ‘many seeded’.